1. In a bowl combine the vinegar with 3 3/4 bottles of water. 2. Wash the fish thoroughly in this and keep aside. 3. Grind the red chillies, ginger, cumin seeds, peppercorns and 12 cloves of garlic without using water. 4. Mix the fish with this ground masala and turmeric powder. 5. 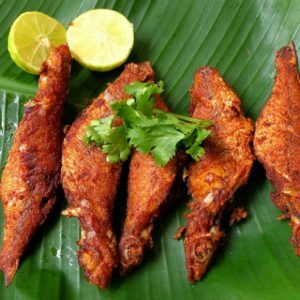 Ensure the fish is well coated with the masala. 6. Arrange the fish in a clean, sterilised jar and sprinkle the crushed garlic and remaining ground spices over it. 7. Pour the vodka and some vinegar over it and ensure the fish is completely submerged. 8. Cover and keep aside for 4 to 6 weeks. 9. To use, using a clean and dry spoon remove the desired quantity and shallow fry on both side for a few minutes. 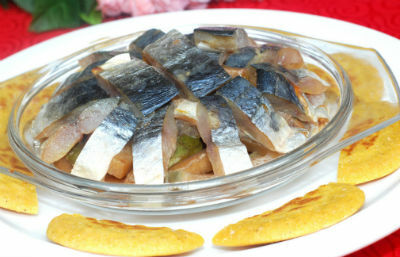 Feel free to comment or share your thoughts on this Pickled Salted Fish Recipe from Awesome Cuisine.